When it comes to budgeting and saving money, everyone has a story. I learned to budget the hard way—out of necessity, and in many ways, out of sheer desperation. (That might be how you found your way here.) Believe me, I know what it’s like to feel desperate about your money situation. When I left the corporate world and my husband and I began to live on less than half of our former income, it called for me to get very creative, diligent, and serious about our budget. But when he got laid off several months later, I understood desperate. If we hadn’t had our budget in place, we would have had no direction, and no way to pick up the pieces. Learning how to budget is easier than you think. I’ve got all the tools you need right here, along with the encouragement you need to stay on track. So much of learning any new habit begins with consistency. You will have to stretch outside your comfort zone to tackle budgeting. You will have to acquire some discipline. And you will have to get it in your head that budgeting is your new lifestyle. It’s something that my husband and I sit down and do at the beginning of every month. And you know what? I look forward to it. I have learned to budget and to enjoy it because I know it brings me something that I didn’t have before: freedom. I am free from being desperate and worried about our finances because we are the ones who decide where our money is going every month. We’ve learned how to anticipate expenses and keep money tucked away to deal with them. And incredibly? Our budget not only allows us to live on the money we make—it allows us to give on the money we make. There is nothing better than knowing where you stand financially each month. Find out how much you are spending. This can be accomplished by looking over last month’s bank statement. Where does your money go? Did you realize how much money you were spending? Decide where you want your money to go. Think of this as “re-directing” your financial focus. Determine some goals for your money. Your number one goal should be to get rid of debt! 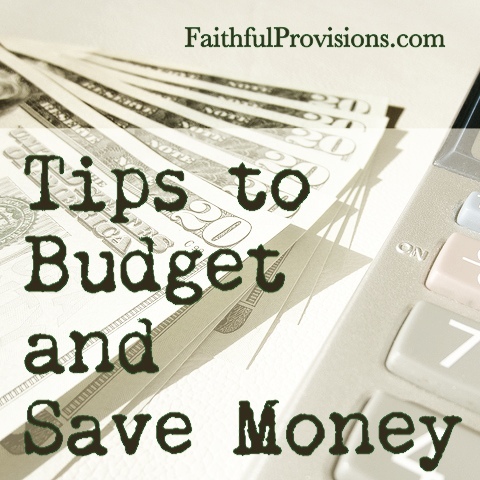 Create a budget for your household and stick to it! :: Discover my Budgeting 101 Series HERE to tackle budgeting one step at a time–plus, you’ll get the details from my own personal budgeting journey! 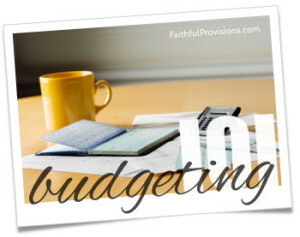 Need someone to walk you through budgeting? Check out the personal budget spreadsheet HERE that we’ve created for you. With easy-to-follow directions built in, it’s like having a personal financial planner guide you through the process. You really can learn how to do this! Get ready to find out exactly where your money is going when you map out your household budget like this. If you’ve never done this before, you may be surprised to see where your expenditures are really adding up. Most people that I talk to tell me they are floored to find out how much they are spending on food. That seems to be one of the biggest shockers. 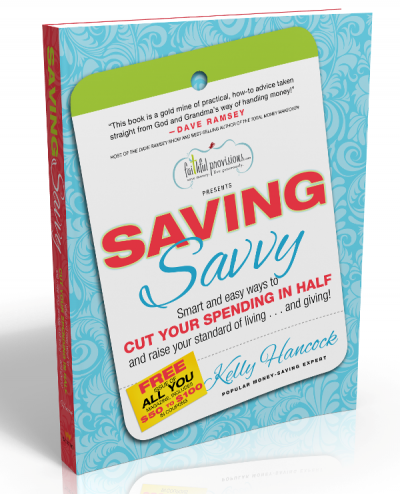 But here’s the good news: I have several free downloadable tools as well as articles that will help you learn how to save money at the grocery store. :: Get started saving on your household budget HERE. Thanks so much for teaching the class the other night. I really enjoyed it and learned a lot. I check your blog daily and think it is wonderful! I LOVED YOUR CLASS THE OTHER NIGHT. I WENT TO THE NEW BELLE MEADE PUBLIX, SAVED $87.20 ON GROCERIES THANKS TO BUY 1/GET 1 FREE COUPLED W/ COUPONS…AND I HAVE A NEW BEST FRIEND CASHIER SUZI WHO WAS SO NICE AND PATIENT WITH ALL MY COUPONS AND EVEN ANNOUNCED HOW MUCH I’D SAVED TO THE PEOPLE IN LINE BEHIND ME! SHE TOLD ME ABOUT A SITE SHE LIKES CALLED SUZYCOUPON.COM BUT I HAVEN’T CHECKED IT OUT YET. THANKS SO MUCH! NOW, OFF TO GET THAT FREE COTTONELLE TP! Tyler and I have been budgeting since we were first married, and let me tell you, it has cut down on our money fights! When we want to buy something, we always say “Put it on the budget!” Since Tyler is now self-employed, it is a little more difficult to stay on budget especially when income is tight. Budgeting monthly has helped us stretch our dollars because we know where every dollar is going. Most importantly, it keeps communication open in my marriage! One idea that my husband and I did when trying to figure out our budget, was for three months I just recorded how much we ACTUALLY spent in each category. Then after the three months, we looked at each category and decided if that was a good budget or if we had spent too much in that category. One example may be gas for your car. If you don’t know accurately how much you spend a month in this category than this might be a good idea. Also, I looked at our groceries and averaged them for the three months to know how much to spend in this category. If we were not saving as much as we would like then I would look at where we could cut back to save more money. I know the area I struggle in is groceries. We do not eat out much, but I do not seem to be able to get our grocery bill under $250 a month for the two of us. It is an ongoing process. Just wanted to throw that out there to help people figure out how much to budget in each area. Love checking your blog for the deals!!! One other question I had regarding this week’s class was whether anyone has done an inventory per se of rock-bottom prices around town. I get cutting coupons and two for one deals, but how low do chicken breasts, whole chickens, formulas, diapers go? What is the best way to know when things are on sale? I have three kids under age 4 so I don’t have any spare time to scout out Publix, Kroger, Target, Walgreen’s, CVS in any given week. For example…I was pricing whole chickens but I have no idea whether $4/lb is a good deal or highway robbery. Any thoughts? I also appreciated the class! I have been doing e-Mealz for our family (of 5) meal plans since August. It has been a HUGE stress reliever for me because it takes away the questions “what’s for dinner”? The hard part I’m trying to overcome is how to save on all the “rest of the stuff”? For example, I budget $150 wk/. My meal plan might budget $75-85/wk but I end up spending almost double that when I’m at the checkout because of all the rest of the stuff (toiletries, milk, breakfast, etc.) So my question is: Once you have a budget and a meal plan, how do you incorporate the deals into your budget?????? When you first start shopping in the “stockpiling” mode, you begin to meal plan around what you have and what is on sale that week (sales flyers). Then, you would allow a little extra in your budget (depending on your budget it could be from $10-50?) for only the “rock-bottom” deals. So, you have your needs list (for produce, dairy, necessities) which you try to base off of sales, then you have your stockpile/good deals list of things you may not need right now, but you will need later and it is a very good price right now, so you are going to get enough to get you through to the next sale. As your stockpile grows over the course of 3-6 months, your “needs list” will begin to go down, and will be only things like dairy, produce etc. So, the things on your grocery list after 6 months-1 year will only be milk, eggs, grapes + the great deals this week. Because you have everything else in your pantry/freezer/fridge. I hope this helps. Anyone else have some advice? Another good question… Miller’s question on rock-bottom prices list. Oh, $4/lb for a whole chicken is HIGHWAY ROBBERY!! As you begin to do this you will develop a knack for knowing your rockbottom prices on things. But, for the items you see as big budget breakers at the grocery (meats, cerealssheet, but if you go to the Aldi link on the left, there is a spreadsheet for prices at Aldi vs Walmart and that is a good place to start. You can keep a small spiral notebook in your grocery bag and keep track when you find a good price. I know a lot of people have a spreadsheet. Can anyone help here? I hope this helps, anyone else? Thanks for the tips. Very interesting to see the 99 cent price on ground turkey. I thought I was getting a good deal @ $2.29/lb at Costco, but I guess not! Hi Kelly! Thank you so much for your blog! I have learned a ton in a few short weeks of reading and attempting to follow along! One big thing I’ve learned is to take the time (gets shorter each week) to make the lists and then shop with the coupons in hand. Just yesterday, our family saved $58 off a $99 grocery bill and I was thrilled! Not to mention my wonderful husband was blown away! He wanted to know my secret as he can’t walk in a store without robbing a bank with all he purchases! Thanks again! I look forward to continued savings and a happier family since I am already not so stressed out! Oh, and the holiday picture savings you did today was GREAT! We have already ordered 50 4×6 prints and it cost us $-0- and the shipping was free too! This is awesome! !